So....we're in Thailand! Arrived Tuesday night about 9pm into Bangkok airport sleepy and a little jet lagged. Had a slightly scary ride from the airport into central bangkok to where we were staying...no seatbelts in the back and cars were just overtaking as and when they liked at one point I thought we were going to get bashed into on both sides of the car! Certainly a way to be introduced to the city! We're staying a hotel tucked in a corner along a lovely bustling street just off Koh San Rd, pretty basic but nice anc clean. And there is air con, which we have come to appreciate VERY much! Within minutes of stepping outside, the heat just hits you. The mix of smells on the streets is not the most pleasent. a mix of fresh thai food and then a bit of sweat, raw meat, fish and car fumes all in one. I was tempted to buy myself a face mask today whilst sitting amongst traffic in a tuk tuk, can't be good for you breathing in all of the fumes! We had our firt tuk tuk ride yesterday, we managed to bargain quite a good deal with a guy called Num who became our personal driver for the day. It was our plan to find the Vietnamese embassy in the morning, however, after trying to navigate our way across a massive roundabout (that's another thing here, you have to just walk out into the middle of the busy road, cars zooming past everywhere and just risk your life walking in front of them although they do kindly stop...at the last minute). So we were navigating our way to ty and find a bus stop that would take us to the embassy - but met a lovely thai lady on our way who said the embassy was closed but we could go to a TAT office- tourist centre, who would help us buy visas and give us advice on anything we needed...she called over a tuk tuk for us and told our driver to charge us 20thb for the day which would include a tour of 4 temples and the TAT centre...but of course it had to also include a trip to a jewellery store, tailor shop and a handbag shop - we kindly looked around then said no and walked out. They follow you as you walk round, is quite uncomfortable. In the evening we went to MBK shopping centre, massive place! Then got on a bus home, which took us in the wrong direction but kindly dropped us off so we could cross the road and catch the correct one home. Took us about 2 hours to have a 30 min journey..think we caught rush hour! The TAT sorted out our visa, although this afternoon we found out that we've been ripped off a fair bit...cost us 4,000thb when it should probably have been more like 2,000! oops...our first experience of being nieve tourists. 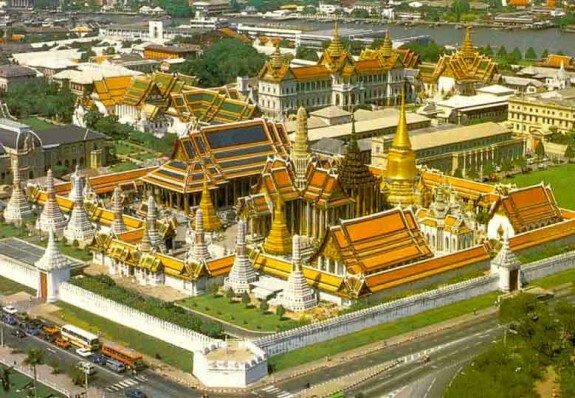 Today we went to the Grand Palace....OMG it was sooooo hot! Didn't help also, that I got called over at the gate for wearing leggings...they are not acceptible! !So, I had to cross the street and borrow a lovely little flowery number from a stall for 30thb. So, I was wearing black leggins, a sarong over a dress and a cardigan! SO HOT, think i sweated my own body weight. But, well worth it, the palace was beautiful. We then took a trip to China Town, on a public bus..the woman on board was really nice. In fact everyone we've met has been so kind and smiley. We seem to be able to get through anything just by simply smiling. Didn't last very long in china town, way too manic and busy! People, cars, cats, dogs, kids, food, fumes..everywhere. So we got a tuk tuk back to koh san road, another scary journey. I think because we barterd too much he decided to give us a 'fun' journey home...which involved racing so quickly round a roundabout I thought the whole tuk tuk was going to turn over! Ahhhhh anyway we made it home all in one piece! So...currently sat in a lovely bar full of travellers and an acoustic band singing the likes of tracy chapman and neil young just off the koh san road. I think we're both ready to leave Bangkok now, the muggy heat will probably follow us, but the mad bustling city life and busyness I hope we leave for a while. It will be nice to see some different wildlife and landscapes.